All those nasty jokes and memes after the NBA Finals? He’s been through a lot worse. MILLSTONE TOWNSHIP, N.J. — The streets that made the man are wide and smooth, flanked by lush woods, cornfields, spacious lawns and wooden two-beam horse fences. Geese fly in formation overhead. There are no traffic lights. J.R. Smith grew up here with his parents and three siblings. He lives here now with his wife and their three daughters. And he returned here this past summer after making one of the most colossal mistakes in NBA history. This is where Smith came to heal. In Millstone Township, Smith did what married fathers do: made breakfast for his girls, shopped at Walmart, played golf, took his eldest daughter to soccer practice. Then he would make the 60-mile drive to a basketball court in New York City, where he drowned his sorrows in sweat and jump shots. Smith’s 14-year NBA career has been filled with mistakes, so many that forgetting the score at the end of Game 1 in the 2018 Finals just seemed like J.R. being J.R. The aftermath of Game 1 hasn’t been that hard, really. He’s been through much worse. The court at the luxe Life Time Athletic at Sky club in midtown Manhattan is the place that hosted superstar open runs with LeBron James, Kevin Durant, Russell Westbrook and James Harden. The blond wood floor gleams. A two-story glass wall is built for gawking. The NBA-distance 3-point line beckons. Behind that arc is where the 6-foot-6 Smith is working on a July afternoon, the only player in the gym, supervised by his longtime friend and trainer, Chris Brickley. “This has been by far the most he’s been in the gym,” says Brickley, who has known Smith for 10 years. “We’ve worked out at 7 in the morning this summer, 8 in the morning this summer. We’ve also worked out at midnight. We’ve put in a ton of work. This has been the most that I’ve witnessed him work on his game. … Some days, you can tell when he’s out there that that’s his getaway. His peace of mind. You can just see it in his face. “That situation” came at the end of the fourth quarter of Game 1 at the Golden State Warriors’ Oracle Arena. With the score tied at 107, Cleveland Cavaliers point guard George Hill missed his second free throw. Smith grabbed the offensive rebound with 4.7 seconds left but dribbled away from the basket instead of trying to make a play, pass to James or use Cleveland’s last timeout. The blunder cost Cleveland a chance to steal Game 1 on the road against the heavily favored Warriors. The Cavs unraveled in overtime, then got swept. Then James left for the Los Angeles Lakers. When the Naismith Memorial Basketball Hall of Fame opens a social media wing, memes of James’ incredulous pose will be inducted on the first ballot. Smith was mocked at The ESPYS. Every time he posted something on Instagram for his 4 million followers, the comments filled up with cruel remarks. The entire episode made Smith the new Chris Webber — a gifted player branded by one devastating moment. “It was tough, but it was the same after Game 2, 3 and 4. I didn’t take it no harder than those losses just because I made a mistake,” Smith said. “We all make mistakes. For my teammates to know that and have my back, [Game 1] wasn’t that bad. Talked to my coaches, everybody stood behind me 100 percent. The main thing was, OK, granted, you didn’t shoot the ball, but what if you ain’t get the rebound? Then what? We still would have been in the same situation. I could have shot and missed. Then what? But when Webber called a timeout Michigan didn’t have at the end of the 1993 NCAA championship game, there was no history of bad judgment. Smith, on the other hand, had “messed up” many times. There was the brawl in Madison Square Garden. Untying an opponent’s shoelaces during a game – make that two different games. A marijuana suspension. A one-game playoff suspension for throwing an elbow. Tweeting a photo of a model’s thonged rear end from his hotel room. Forgetting the score at the end of a regular-season game. The list goes on. Smith went pro straight out of St. Benedict’s Preparatory School in Newark with the 18th pick in the 2004 draft, the last draft before the NBA required high schoolers to wait until a year after graduation to play. With elevator bounce and no remorse from deep, Smith’s talent was undeniable. But his wild style clashed with old-school coaches Byron Scott in New Orleans and George Karl in Denver. He spent a year in China during the 2011 NBA lockout, then came home to play with the New York Knicks midway through the 2012 season. Smith’s three New York seasons featured some of his best ball and sickest highlights, and he was Sixth Man of the Year in 2013. But he was in New York, the yin to Millstone Township’s yang, and the allure of the big city fueled his reckless tendencies. “It was like a big playground for me,” Smith says. The Cavaliers traded for Smith in 2015, and they don’t end their epic title drought without his hot shooting in the 2016 Finals. But J.R. still did J.R. things in Cleveland, such as throwing a bowl of soup at an assistant coach or leaving his man open for a dunk while dapping up an opponent. His Hennessy-soaked reputation remained. The biggest mistake of Smith’s life happened on June 9, 2007, at the intersection of Stillhouse Road and Stagecoach Road in Millstone Township. There are stop signs at all four corners. Smith, speeding home to a graduation barbecue for his younger brother Chris, illegally passed a stopped car. His GMC Yukon barreled into the intersection and broadsided a Jaguar. Smith and passenger Andre Bell, his best friend from high school, were thrown out of the car. Neither one was wearing a seat belt. Bell died two days later. Smith was 21 at the time, with a history of speeding citations. A grand jury declined to indict him for vehicular homicide, and he pleaded guilty to reckless driving. Smith served 24 days in the Monmouth County Jail, but it took years to escape the agony of remorse. 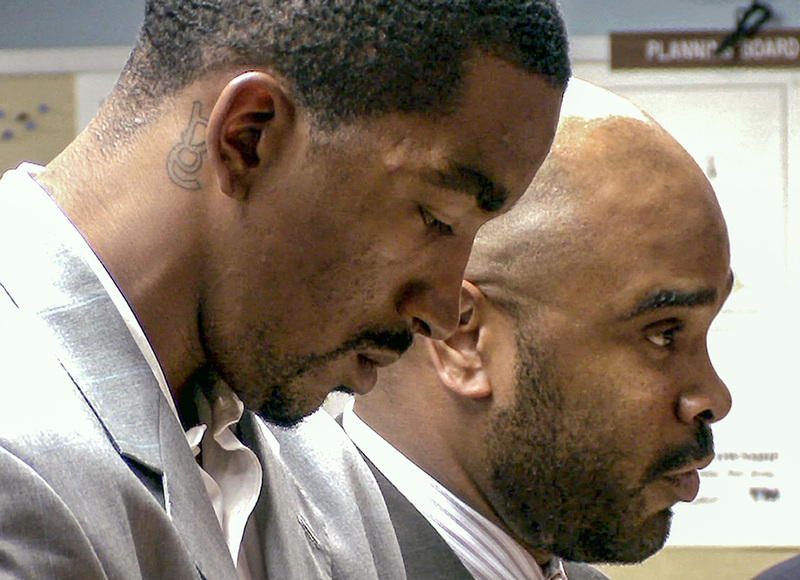 J.R. Smith, left, hangs his head in municipal court in 2009 in Millstone, N.J., as he is sentenced to a 90-day jail term, with 60 days suspended, Smith was sentenced for causing an auto accident that killed his friend in June 2007. At right is his attorney Kevin Hextall. When you mention Smith’s name around Millstone, at the dry cleaner or the firehouse or the post office, nobody talks about the accident. They talk about Smith’s charity golf tournament to benefit his youth foundation, about the free camps he holds for kids and about his parents, who have lived in the area for more than 50 years. Earl Smith supported his son every step of the way, moving with then-18-year-old J.R. to New Orleans (Earl Smith took the master bedroom in J.R.’s house) and waiting for his guidance to take root. As J.R.’s tattoos proliferated and his misadventures mounted, Earl Smith felt every moment of his son’s journey. Especially the fatal accident. Smith lives a few minutes away, in a 7,100-square-foot mansion with luxury vehicles and his father’s construction trucks parked in the driveway. In 2009, he had a daughter with his longtime girlfriend, Jewel Harris. Harris and Smith broke up, and Smith had another daughter with a different woman. But after leaving New York for Cleveland, Smith started to settle down, and he married Harris in 2016. Later that year, Smith and his wife conceived their second daughter. Her birth would test Smith in totally new ways. Dakota was born five months premature on Jan. 2, 2017. She weighed 1 pound and was about the size of a coffee mug. For the first few months of her life, she didn’t make a sound because of the feeding tube down her throat. Her skin was too fragile for her parents to cradle her. Smith was recovering from thumb surgery when Dakota was born. The defending champion Cavs were pressing him to return to the lineup, but for the first time in Smith’s life, his love for the game ebbed. The world narrowed down to Dakota’s tiny body and the rest of his family. Some days, the helplessness made him want to cry and punch a wall at the same time. 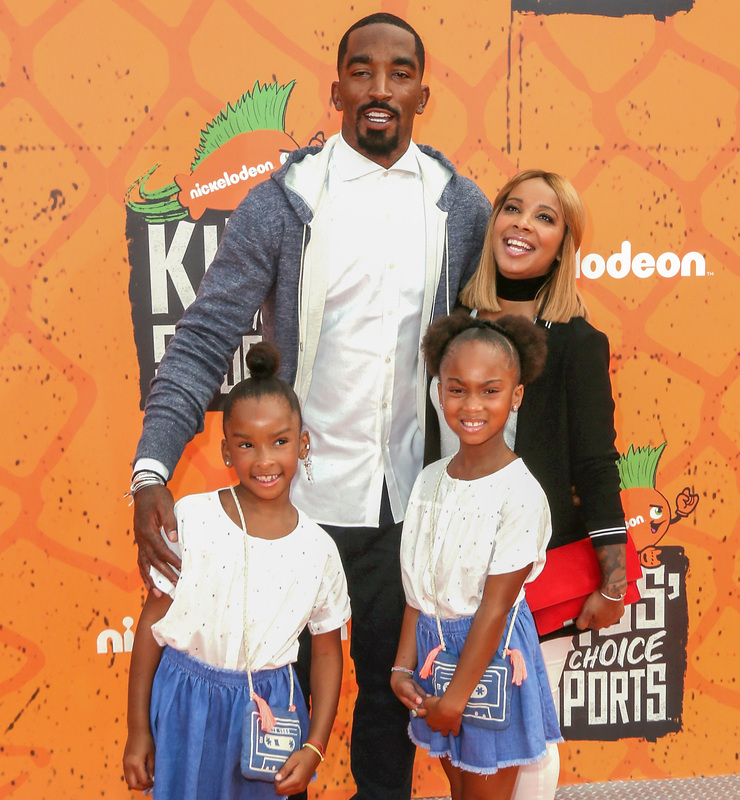 In 2016, before the birth of Dakota, J. R. Smith and his family attended the Nickelodeon Kids’ Choice Sports Awards at UCLA’s Pauley Pavilion. Dakota came home at 5 months old and is now healthy and strong. Smith and his wife went public with the story of Dakota’s birth to inspire other families with premature babies. Their third daughter, Denver, arrived in June. Smith’s house full of women helped keep things in perspective this summer. “The last two years was bad for me,” Smith said. “But being able to go home and have that support, basketball played second fiddle. For so long in my life it was always basketball, basketball, basketball. … Now my mindset is be the best family man as possible. Being an athlete don’t really matter to me. I mean, I want to be the best athlete I can be, but that’s not what I’m focused on. I’m focused on being the best family man I can be. Smith wants to play another six seasons and make it to 20 years in the NBA. But his career goals now reach beyond the court. J.R. will always be J.R. though. He’s currently facing a misdemeanor charge of criminal mischief for throwing someone’s phone outside of a New York City nightclub this summer. Smith said the person was filming him for no good reason. A person with feelings. Smith sees the Instagram insults, the jokes, the legendary James memes. There’s a perception that James is through with Smith because of Game 1. Video showed that James was furious in the moment. But this summer Smith joined James in a softball game in Akron, Ohio, and James Instagrammed brotherly photos of them together at James’ wedding anniversary party in September. They’ve known each other since both were 15, when Smith would travel to Ohio to hoop with the young phenom. 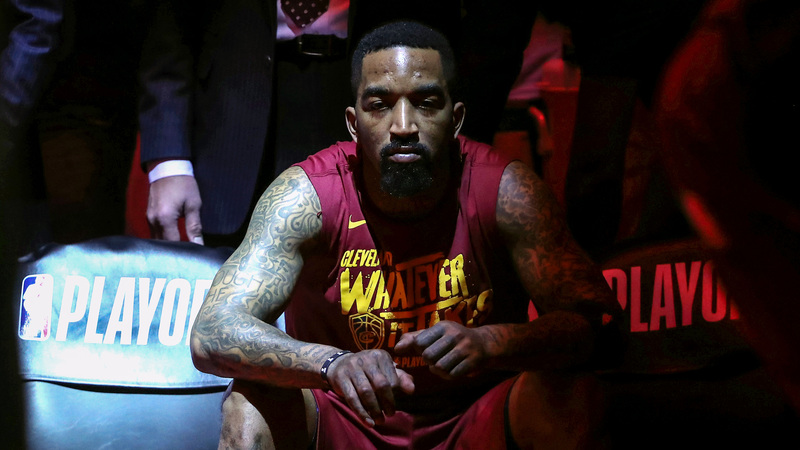 J.R. Smith waits on the bench before the start of the Cavs’ game against the Toronto Raptors in the second round of the 2018 NBA playoffs at Air Canada Centre. “I know what relationship I have with him. He knows how we feel about one another, so I don’t really let [the talk] affect us,” Smith said. “I love him, that’s my brother. I’d do anything and everything for him, and I think it’s reciprocated on both sides. So regardless of what somebody may say, or he left because of me, or because we lost, whatever. James’ departure also could breathe new life into Smith’s game. With the ball always in James’ hands, Smith’s role was to play tough defense and spot up for catch-and-shoot 3s. But Smith still feels athletic enough to put the ball on the floor and create offense for himself and others. That’s what he plans to do this upcoming season. “When you watch him play in an open run with a bunch of All-Star-type guys, he makes shots, he creates and everything,” said Brickley, Smith’s friend and trainer. “And he’s one of the best people that I know from a human being standpoint.